It’s worth noting that Cambodia Noir is not one of the “noir” short story anthologies from Akashic Books (Prison Noir, New Orleans Noir, Twin Cities Noir, etc). With that consumer alert out of the way, Cambodia Noir features ex-war photographer Will Keller in the topsy-turvy corruption and drug-infested chaos of Phnom Penh. If you prefer a heavy injection of cynicism from your noir lead characters, Keller’s cup runneth over. If you expect your noir to move forward on a cool glide of fact-finding and understated exchanges led by a seen-it-all sleuth, seek elsewhere. The definition of noir is certainly in the eye of the beholder, but Keller gets through his bleak days on a fuel of cocaine, whiskey, yaba, joints, and whatever is available in the consciousness-altering trade out on the garbage-filled streets. When we meet first Keller he’s tumbling out of bed at 5:00 a.m. and “fighting, kicking, clawing my way back through last night’s whiskey and cigarette tar and dirty sheets.” His scooter driver Prik “drives like he’s found a way off this rock,” and they rush to a neighborhood drug bust where a grenade explodes. The scooter crashes and they check their wounds amid gunfire. Still focused on doing his job, Keller realizes he needs to focus on his work—getting the shot—and to stop thinking about (salivating over) the ten kilos of junk the cops have just turned up in the raid. Keller is not your ordinary journalist, and this is no ordinary newspaper. He snorts cocaine with his cohorts in the newsroom. He slips roofies to interview subjects when he needs information or wants them to forget what they might have said or done. And he approaches each day with a search for the perfect chemical balance. And it turns out the missing girl is one of the interns from the newspaper where Keller works. Amid June’s left-behind stuff is a diary whose entries provide Keller a few breadcrumbs for the search. Every other chapter is an entry from June’s diary, which gives Keller some obtuse tidbits. If he could only stay sober long enough to read the whole thing at once, well, Cambodia Noir might be a Lydia Davis short story. It turns out June is a good writer so her diary entries are sometimes long and evocative. (Seeley does a nice job contrasting Keller’s voice with June’s.) She writes, she says, “in lieu of exorcism” but fails to jot down exactly what she’s planning or doing. The funny lines keep coming. Keller is a self-loathing piece of substance abuse work. The story is frequently crude, sometimes brutal. As secrets are revealed, Seeley does little hand-holding and offers no cheapie recaps. Readers are expected to keep up. As with many scenes before it, the ending is frayed and untidy; noir doesn’t mean black and white. Noir knows no boundaries, as detectives from Scandinavia to outer space (Warren Hammond’s fine KOP trilogy) have made clear. 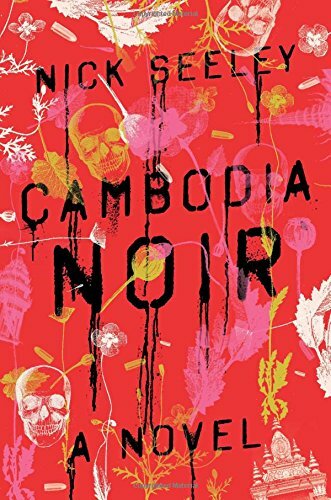 Given Seeley’s vibrant descriptions and all the dark corners Keller uncovers, Cambodia is as good a place as any for a journey to the heart of drug-fueled noirness.